In our last post, we saw how sulfur was extracted and purified in Italy (mainly Sicily) and then further purified in England for the purposes of manufacturing gunpowder. Up to the end of the nineteenth century, Italy was the main source of sulfur for both Europe and America. Therefore, both the British and the French tried to secure their supplies from Italy. In particular, the British managed to secure very favorable trading rights with Sicily in the early 1800s, thanks to rescuing their ruler from Napoleon Bonaparte's invasion. Soon, British, French and American merchants were all trying to get a piece of the Sicilian export market, with British merchants having the most control generally. Many of these British merchants were originally wine merchants, who got into the sulfur trade since they already had well-established transport networks and marketing connections with other regions of the world. There was a brief hiccup in 1839, when a French company named TAC (Taix, Aycard & Company, named after its two founders, Aime Taix and Arsene Aycard) managed to convince the ruler of Sicily, Ferdinand II, to grant them a monopoly and thereby increase the price of sulfur worldwide. This action caused many countries to manufacture sulfur from pyrites and import from other sources (such as Iceland) and nearly caused a war in 1840, before diplomatic efforts succeeded in negotiating a settlement. Nevertheless, sulfur produced from pyrites took a share of the market. Then in 1883, Carl Friedrich Claus, working in London, patented a process called the Claus process, that allowed recovering sulfur from hydrogen sulfide gas. By 1887, Alexander Chance and C.F. Chance modified his process to process sulfur from the left over waste of the Leblanc process (which was used to manufacture soda ash (sodium carbonate), useful for glass, textile and soap industries). 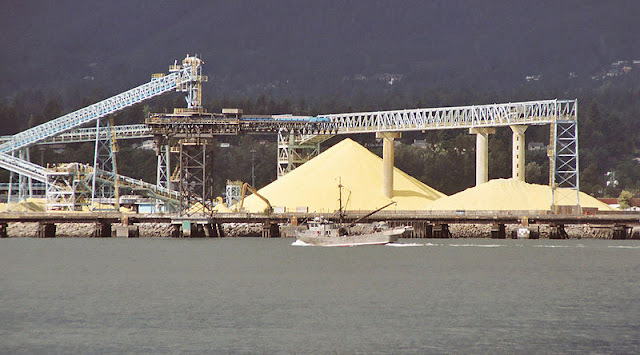 Until then, the waste product of the Leblanc process, which is calcium sulfide, was simply thrown into heaps outside the plant. The Claus-Chance process first converts the calcium sulfide to hydrogen sulfide, using water and carbon dioxide, and then extracts the sulfur from the hydrogen sulfide gas using the Claus process. Therefore, all those heaps of waste calcium sulfide that were thrown out earlier, could be used to extract the sulfur from them. A pile of Sulfur produced by the Claus process in Vancouver, Canada. Click on the image to enlarge. Image licensed under Creative Commons Share Alike 1.0 License by LeonardG. Using the Claus-Chance process, England became the second largest sulfur producer in the world by the early 1890s. The British also attempted to form a cartel to control the Sicilian industry, almost 55 years after the attempt made by the French Company TAC. The Anglo-Sicilian Sulfur Company (ASSC) was formed in 1896, which gained control of about 2/3rd of Sicily's export. In particular, they made some huge sales in the American marketplace, shipping it to many well known companies in the US. However, there was danger to the Anglo-Sicilian Sulfur Company from an American invention that we will study about in our next post: the Frasch process. Sicily was exporting over 177,000 tons to the American market in 1902, 106,000 tons in 1904, and two years later, it dropped to 7000 tons thanks to the new process invented in America! In fact, in 1906 Sicily was no longer the global dominant producer of sulfur, being replaced by sulfur produced in Louisiana and Texas, which was cheaper and purer, and the Anglo-Sicilian Sulfur Company was out of business a couple of years later. However, while the Claus-Chance process went into decline, the Claus process did not go away entirely. In fact, it is still around today and is the dominant method of producing sulfur today, as there is plenty of hydrogen sulfide gas from other sources, especially from oil and natural gas fields and from crude oil refineries. We will study the Frasch process in our next post.